Irish Two Tone Wedding Ring - Celtic Knots - 14 Karat or 18 Karat Gold..
Lough Sheelin is a haven of tranquility, myth and legend, situated at the point where three counties meet - Meath, Westmeath and Cavan. 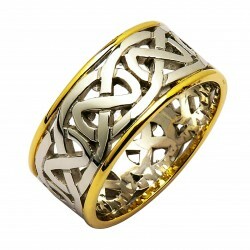 The Sheelin Collection is based on a celtic knot used in The Book Of Kells, which was created nearby. The continuous interlace and overlap of the design represents eternity.